Goats are a popular target for lampooning as pesky animals notorious for eating everything in sight -- from clothes hanging on the clothesline to the newspaper in the driveway. Sheep may not share that somewhat inflated reputation, but they do share a vociferous appetite for weeds, grasses and shrubbery with their goat friends. The two species are also typically compatible, so using a combination can tidy up your lawn or pastures in an environmentally friendly fashion. Goats and sheep eat many of the same plants, so either is a good option for your weed control. However, if you have a lot of unwanted shrubs and small trees, goats are your better option -- they’ll pluck the young seedlings up before you’re challenged with removing them when they're fully grown. Sheep, on the other hand, enjoy more leafy weeds rather than prickly vines or saplings. They both enjoy legumes, even invasive and prolific ones unwanted by home and landowners such as kudzu. Unless you have more shrubs and trees than weeds, you'll likely be satisfied with either sheep or goats performing your land maintenance. 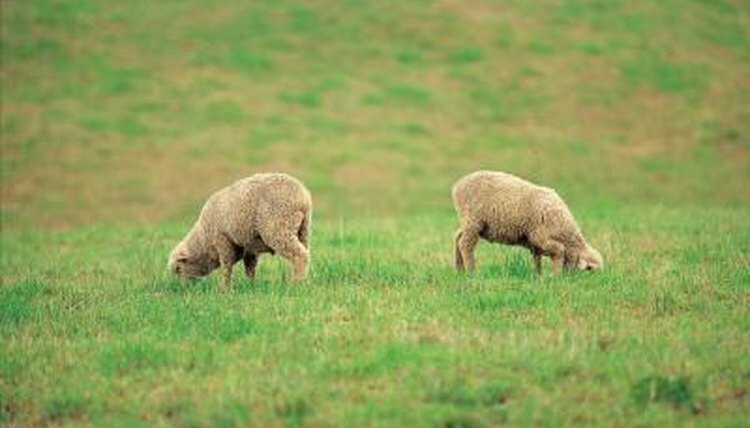 If you want simply want to keep your grasses to a manageable level with some weed control, sheep will perform more than adequately for you. If, however, you need some more aggressive plant attacks against varying types of plants, get some goats to apply for the job. Landowners, municipalities, businesses and land-management agencies incorporate sheep and goat grazing into their land-management practices, hiring businesses that maintain sheep and goats for that purpose. The businesses transport sheep, goats or both to work along roadsides, parks and even around businesses. For some it’s a numbers game: some land is too difficult for mowers to service economically. In other cases, though, there’s an environmental appeal. Sheep and goats don’t burn fossil fuels and they don’t leave deep tire tracks that mar the landscape or disrupt native species’ habitats. Brush management is particularly critical in areas where wildfire management is a concern. Sheep and goats can eat poison ivy and other unwanted plants but they're not completely immune to the toxins of some plants. The good news is that as long as they have enough to eat that won’t hurt them, they are less likely to attack plants that can cause harm. Many livestock species are susceptible to oleander toxins, and sheep and goats are no exception. Avocado plants can also cause problems for goats. Schedule an appointment with your county extension agent to help you identify any plants on your land that might be toxic to sheep and goats before you acquire any or hire anyone to bring them out for grazing. The good news is that ingesting toxins is not always fatal for sheep and goats; in many cases, they have to eat large quantities for the effects to be fatal.